Now, the person who has brought celery juice into the lime light (no lean pun intended) is a man who goes by the name the Medical Medium (his real name is Anthony Williams). He has made juicing and most notably celery juicing (is that a word?) EXTREMELY popular. So popular in fact that in some grocery stores, celery is sold out!!! So, Brodie and I wanted to know if drinking celery juice every day was a miracle cure! We bought a juicer (linked here), drove ALL over town trying to find celery, we read TWO celery juicing books, AND we followed the medical mediums celery juice protocol for 7 days! You can watch the video below to find out EXACTLY how celery juice affected Brodie and I , and I’ll give you all my lean thoughts about the experience! Likewise, I also answer some of the most frequently asked questions about celery juice. That way, you will know exactly how to juice if you decide to give it a go!!! Cleans out liver - One of the main areas of the body benefited by drinking celery juice is your liver. Celery juice helps to flush any built up toxins out of the liver! Cleaning out your liver is super important because many illnesses (both mild and chronic) stem from having a heavy or sluggish liver. It also helps strengthen your bile, which plays a big role in the breaking down of food in your small intestines. Stomach/ gut health - Celery contains compounds and antioxidants which helps with any kind of stomach issues and inflammation such as bloating, gas, acid reflux and constipation. It can help you stay regular and reduce symptoms of IBS. High blood pressure - Due to the high content of water and potassium in celery juice, it can help to lower your blood pressure over time. Helps fight cancer and other Illness - Over time, the drinking of celery juice has been shown to help fight the growth of cancer cells. It can also help to strengthen the immune system and help fight off or kill other illness and bacteria, such as the common cold, viruses, funguses, or yeast. 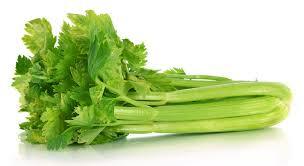 More on Celery Juice - How and When to Drink Celery Juice to get all the Benefits of it. Firstly, all of the protocol I am describing is based on the Medical Mediums suggestions. However, if you watch my review of celery juice, you will see I have a few suggestions as to how it worked best for me! Secondly, you are going to need a juicer! I talk in more detail about which juicer to buy in the video however, I wanted to link it here!! It’s very important you get the right type of juicer (The good news is it won’t break the bank!). Likewise, you will notice that I am linking a different one than in my video. That is because the price of my juicer doubled since the Medical Medium endorsed celery juicing! However, the good news is there is an equally good juicer for half the price!!!! The suggested serving each morning is approximately 16 oz, which is equal to about 1 whole stock of celery! Another thing to keep in mind when trying celery juice is that its benefits are rarely seen right away. It’s not something you can do for two days and then stop, celery juicing is something that you have to do consistently. In fact, in the first few days, your body is just getting used to the juice, so often times you may experience symptoms such as gas, unsettled stomach, or breakouts - but don’t worry this is normal! Your body is DETOXIFYING, and these symptoms are the result of toxins making their way out of your body! The best way to benefit from celery juice is working it into your morning routine; make it a habit. If you give these tips a go, DEFINITELY, DEFINITELY let me know your thoughts on celery juice! Leave a comment in the Celery Juicing video as I am super interested in hearing about your experiences!!! P.S. Make sure you watch the video to find out everything you need to know about Juicing!! !